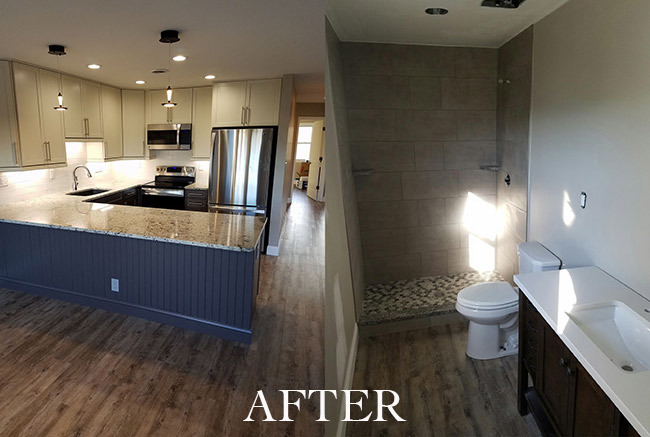 At the beginning of November, we were contacted by a couple who owned a condo in Surfside Beach who was looking for a kitchen remodel and bathroom remodel. Below are a few pictures of what their condo looked like before their Surfside Beach condo remodel started. Their condo was outdated and definitely needed a refresher. Good thing for them, they called the right guys for the job! Our home remodeling services were put to the test. We decided to replace the old blue carpeting with brand new hardwood flooring and bust out the wall that divided the kitchen and the hallway to open the space up a bit. We replace all of the cabinets and installed new drop lighting. We added a pop of color to the island and got rid of that old, wooden look. Granite countertops and brand new appliances also helped to update the kitchen area. Now, on to the bathroom remodel! 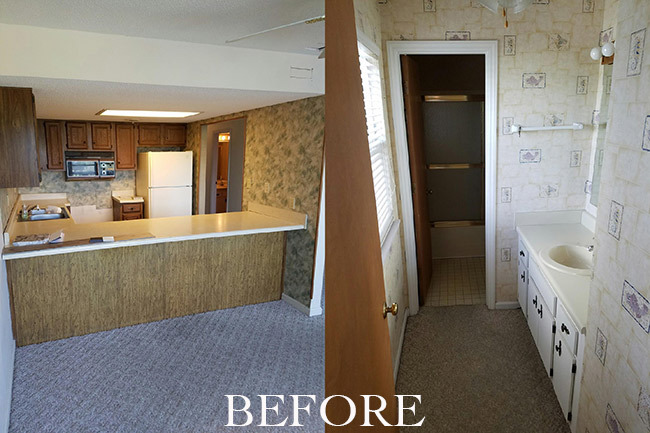 If you look at the photo below, their new bathroom looks like a totally different space! The toilet is no longer enclosed with the shower and we also removed the tub. Carpeting was again replaced with new hardwood flooring. Interested in a remodel of my bathroom.